What is AsicBoost and are these patent infringement allegations backed by facts? Let us begin with some history and dive into what gave birth to this heated debate. AsicBoost appears to have been invented by Dr. Timo Hanke and Sergio Lerner. Dr. Hanke has a Ph.D. in Mathematics from the University of Potsdam and served as Assistant Professor in Mathematics at RWTH Aachen University in Germany for over 6 years. Sergio Lerner is a computer scientist and has a Master in Computer Science from the University of Buenos Aires. Dr. Hanke and Sergio Lerner are listed as joint inventors on the AsicBoost patent application. Based on publicly available material from the United States Patent Office (“US Patent Office”), the inventors of AsicBoost first sought patent protection on November 19, 2013, when they filed a provisional patent application with the US Patent Office. A year later, they filed a PCT application. Lastly, on April 28, 2016, they filed a non-provisional application with the US Patent Office (US Pat. App. №15/141,063, “the US patent application”), which is currently still pending. 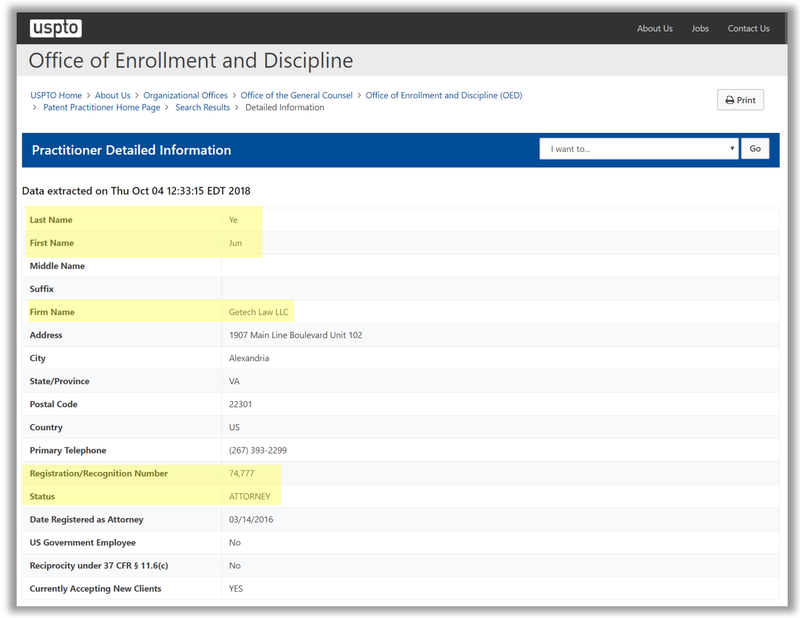 In addition to seeking protection in the US, the US patent application also has counterpart patent applications filed in, e.g., Europe (EP2014864642A, “the EP patent application”) and China (CN201480073590A, “the China patent application”). Moreover, Jun Ye goes on to claim that “no individual or business entity has been authorized to use or sell products based on the ASICBOOST patent application” and that his law firm has “no choice but to take legal actions to protect the legal rights of the patent holding company, including but not limited to seeking compensation of all losses and damages since the patent was published.” Interestingly, while Jun Ye asserts that his law firm represents the patent holding company that now owns the US patent application, he refrains from disclosing the identity of the “patent holding company” that apparently wants to take legal action. What we do know is that the inventors Dr. Hanke and Sergio Lerner may no longer own the rights to the US patent application. Based on public assignment records from the US Patent Office, the US patent application has changed ownership three times. On November 18, 2014, Dr. Hanke and Sergio Lerner assigned the rights of the US patent application to Sunrise Technology Group, LLC, a company based in Austin, Texas. Subsequently, Sunrise Technology Group assigned the US patent application to Little Dragon Technology LLC, which is based in Saratoga, California. 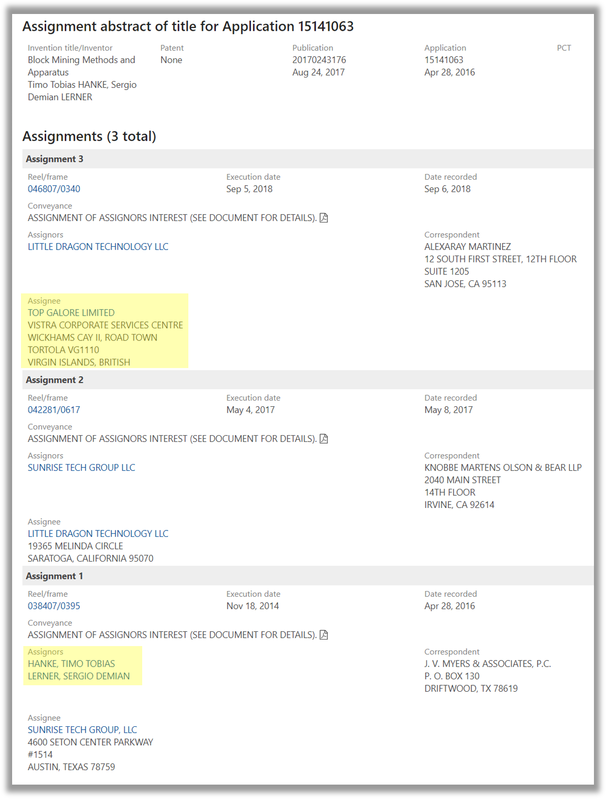 Most recently, on September 5, 2018, Little Dragon Technology LLC assigned the US patent application to Top Galore Limited. Little is known about “Top Galore Limited,” except that it is apparently a company with a British Virgin Islands address. Jun Ye’s open letter is fraught with problems. While I believe that everyone is entitled to their own opinion regarding the AsicBoost technology, no one has the right to intentionally confuse and mislead the Bitcoin community. 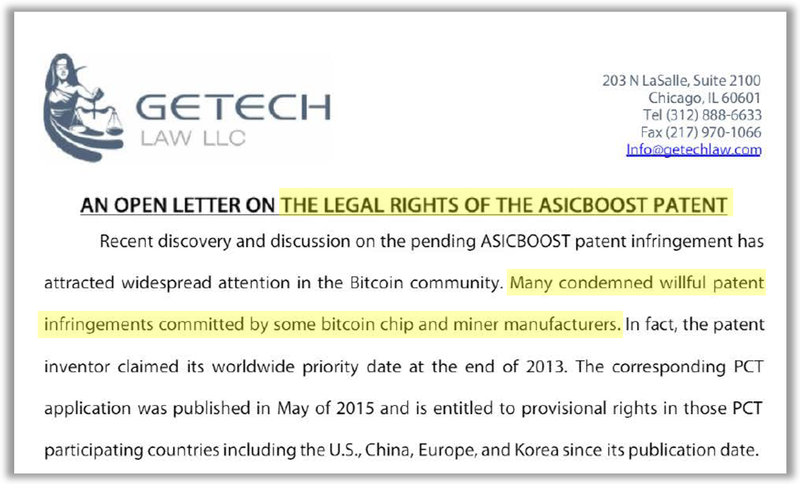 To begin, the open letter is titled “An Open Letter on the Legal Rights of the AsicBoost Patent.” The terms “the AsicBoost Patent” is misleading and false, as the US patent application has not, and may never, issue into a granted patent, in the US or elsewhere. s its name implies, a patent application is nothing more than an application and can in no way be equated to a granted patent. The US Patent Office, for example, reviews tens of thousands of patent applications on a yearly basis, and many of the reviewed patent applications never issue into granted US patents. In fact, Dr. Hanke’s US patent application is being examined by a US Patent Office art unit that grants less than a third of patent applications that it reviews. As Jun Ye, the author of the open letter, is apparently a US patent attorney (Registration №74,777), one can hardly believe that he failed to understand the difference between a patent application and a granted patent. Here, the letter implies that certain miner manufacturers are engaged in “infringement activities.” But this is simply not possible, as it is settled law that no one can infringe a pending patent application before it issued into a granted patent. Why? Because a patent’s scope is defined by specialized legal language called “claims” that resides at the end of granted patents. As the US Patent Office examines a patent application, the inventor and his attorney will, with near certainty, amend the pending claims time and again as they try to persuade the Examiner that their patent application should be allowed. But every time the inventor amends the claims, the scope of the patent application changes, making it meaningless to talk about whether a device “infringes” pending claims. To further illustrate this point, consider the consequences of allowing one to assert pending claims of a non-granted patent application. If that were possible, then nothing would prevent, e.g., a malicious patent troll to draft broad patent claims that cover, for instance, all existing smart phones and then proceed to sue all smart phone manufacturers without having to go through the patent examination process. Even if at one point in time, the claim language of a pending patent application appears relevant to a particular device, that claim language may get amended in a few months, rendering it completely irrelevant to the same device. To address these concerns, the law is clear that one can only sue for patent infringement after a patent is granted. (See, e.g., 35 U.S.C. § 271). At present, Getech Law has no patent rights to assert in connection with the US patent application. Activities such as making, offering to sell, selling, or using the claimed invention prior to the issuance of a patent do not constitute infringement. In a nutshell, the US patent application has not and may never result in a granted US patent. As the US patent application remains an application, no one, including miner manufacturers or anyone else, can “infringe” the pending US patent application. As we touched upon briefly above, Dr. Hanke and Sergio Lerner’s invention is, in essence, using a general purpose computing device to perform a mathematical calculation. In fact, Dr. Hanke and Sergio Lerner themselves stressed time and again how their invention could be applied to all types of computing devices. In sum, the invention described in the US patent application relates to an algorithmic optimization and can be applied on any general purpose computing device. This is precisely the type of invention that the U.S. Supreme Court has deemed to be unpatentable. Thus, it is no accident, and not surprising, that the US patent application currently stands rejected by the US Patent Office. While Europe and China have different legal standards, similar principles exist, and counterparts of the US patent application have also been rejected in Europe and China. 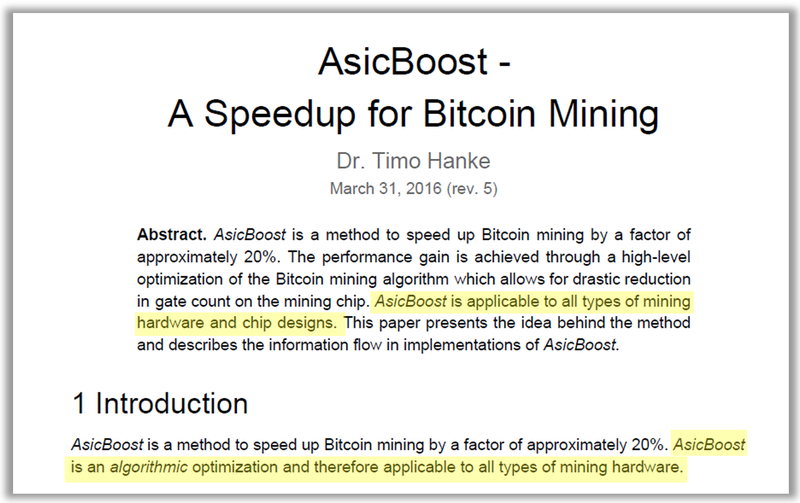 As noted above, Dr. Hanke, agreed with this characterization as he wrote in his own white paper that “AsicBoost is an algorithmic optimization and therefore applicable to all types of mining hardware.” Even today, Dr. Timo Hanke writes on his LinkedIn page that “AsicBoost is applicable to all types of chip designs.” In other words, Dr. Hanke does not dispute that his invention is about optimizing algorithms and could be done by any generic computer, as the Examiner noted. In light of this, it is highly doubtful that the US patent application could ever overcome the US Patent Office’s patent eligibility rejection. Moreover, the problems with the US patent application do not end there. In addition to the above, the US Patent Office also rejected the US patent application under 35 U.S.C. § 103 as being unpatentable over existing prior art. Specifically, after performing a search, the Patent Examiner identified several prior patents and patent applications that predated the invention. To put it simply, the US Patent Office’s rejection means that the Patent Examiner believes others had previously conceived the idea that is now claimed by Dr. Hanke’s US patent application. Based on the challenges that the US patent application face, it is entirely possible that the US application will never turn into a patent. As such, it is doubtful whether the European Patent Office will ever grant the EP patent application. The China patent application faces similar rejections by the China National Intellectual Property Administration (“CNIPA”). Much like the US and Europe, China does not consider pure mathematical abstract ideas to be patentable subject matter. Specifically, the subject matter claimed by the China patent application is an invention that relates to computer programming based on an optimization method for a hashing function. Because the China patent application is based on a pure mathematical idea, which is not a technical method that uses the laws of nature and cannot solve any technical problem, under China Patent Law, the subject matter of the China patent application is not patentable. As of today, CNIPA has rejected the China patent application multiple times, each time citing that the invention relates to an abstract mathematical idea and thus fails to comply with applicable China patent law. For example, the Chinese Examiner noted that the method described by the invention relates to “a pure mathematical calculation method, and does not utilize technical solutions” and “in substance, does not solve a technical problem.” On August 6, 2018, CNIPA issued a final decision rejecting the China patent application. 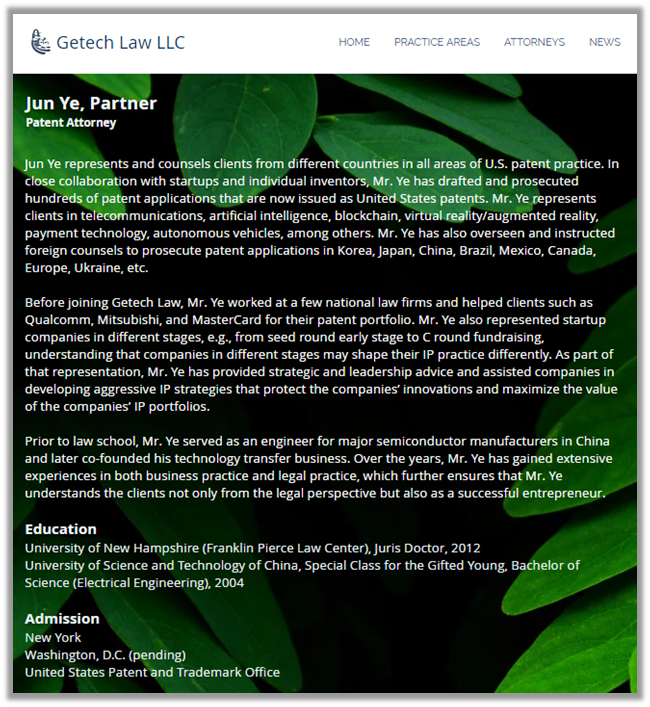 I do not understand why Jun Ye, a partner and registered patent attorney at Getech Law, chose to publish, in May 2017, an open letter so fraught with legal inaccuracies and misleading statements. His open letter sparked intense debate on whether members of the Bitcoin community should use AsicBoost, and whether certain mining manufacturer companies “infringe” the AsicBoost patent. All we know is that this AsicBoost patent belongs to a patent holding company, possibly “Top Galore Limited,” conveniently tucked away in the British Virgin Islands. The motivations of Jun Ye, his law firm Getech Law, and the parties in charge of the unnamed patent holding company, remain hidden. Regardless, certain facts are clear — Dr. Hanke and Sergio Lerner’s invention does not have, and may never receive, patent protection in the US or elsewhere. Indeed, publicly available records show that their invention stand rejected in the US, Europe, and China because it relates to an abstract idea that, at its core, is nothing more than using a general purpose computing device to perform some mathematical calculations. As there is not a single granted patent anywhere, no person or company can “infringe” the AsicBoost patent. Whether you want to use AsicBoost is your choice. And it is our right to have access to simple, unbiased facts to make that decision. Neither Jun Ye, his law firm, or some hidden corporate entity, should get to lie and mislead the Bitcoin community to benefit their own self-interest.